I am thinking of setting up and moderating a space diplomacy game. Posts will pretty much be done entirely by me, everything else will be handled via PM. I am seeing the posts being done in an Interplanetary Newscast fashion. Opponents, or allies are going to be the other players. I'd like to keep this anonymous so no one knows who they are playing against in this game. So, any takers? PM me! Man sprang forth from Terra and rapidly colonized the stars. This rapid expansion could not be sustained, and many of the colonies failed as the existing fleet of ships was not able to keep up with the dual demands of expanding colonization and providing logistics to existing colonies. After a disastrous civil war, Terra has cut the majority of colonies loose, no longer providing logistic, military, or humanitarian aid. The worlds still serviced by the Terran fleet have consolidated into the Terran Hegemony, existing as a semi-closed space power. The outside colonies have fallen on a dark age of technology and now have to bootstrap themselves back up into the stars. Many colonies have fallen into brutal dictatorships, prison worlds, experiments in culture and the like. Many of the colonies have adopted piracy preying on weak and defenseless colonies. Provincial Worlds are long established, mostly self sufficient worlds. Frontier Worlds are newly colonized, and are reliant on regular support from a provincial or core world. Territorial Worlds are planets that are uninhabited, or have tiny populations, but are still claimed by the power for resource, strategic, or other reasons. FTL Travel is facilitated by Hyperspace, which is entered via a jump engine, or stationary jump gate (very rare). Navigating hyperspace is not the same as moving in real space. Communication between stars is done via hyperspace broadcasting (yes you can build a station or habitat in hyperspace) Communications have failed between the stars since Terra withdrew its fleet of comm ships and satellites. The Stellar Nations is a bit of a joke, a forum for the various space powers to come together and discuss and deal with matters between themselves. Currently there is one member, the Terran Hegemony. There are a few other solitary worlds that have sent representatives to the SN (The players). The SN distributes technology and very limited humanitarian aid to failing and fledgeling worlds. It promotes basic human rights, humanitarian aid technology, and actively discourages further colonization. Two more players have joined the Space Diplomacy Game! Players 2 and 3 I would like some background fluff material, who are your people, what are they like, etc. 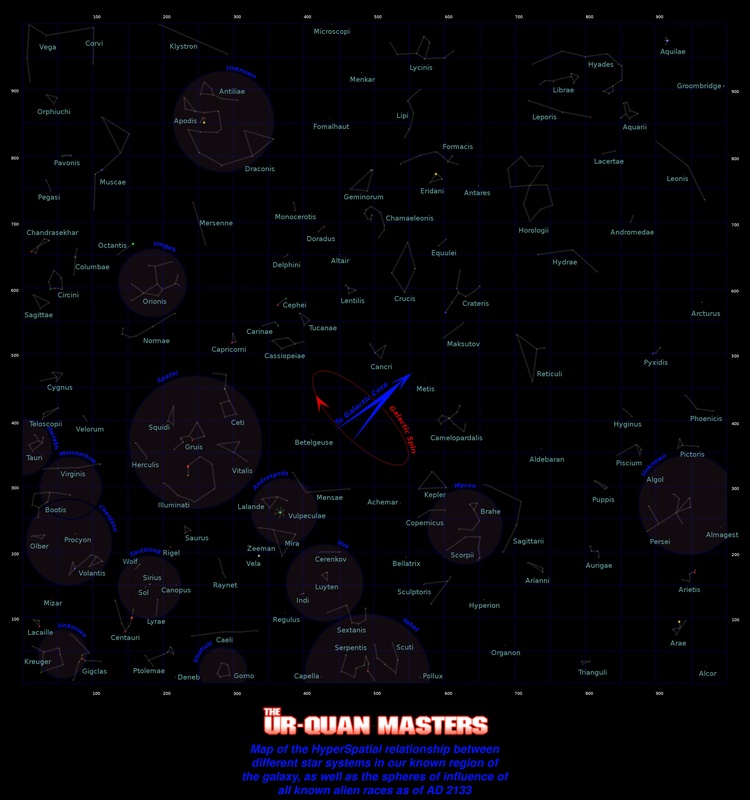 I am borrowing this map, disregard the mentions of other alien races and such on the map, the only races that are going to be used are going to be the players.